Perfect for your destination fête! From starfish to palm trees, top off your tropical wedding theme. With designs featuring mason jars, trees, and lace —browse designs with a romantic rustic vibe. 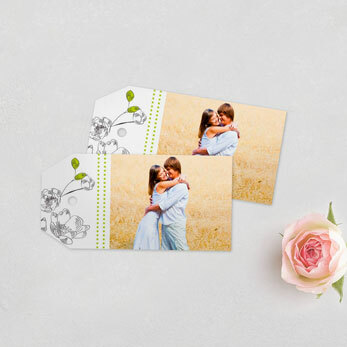 From engagement photos to vacation snapshots, capture your unique love on a photo design. Wedding Favor Tags... the smallest details add up to make the biggest difference! If you're looking for personalized gift tags to complement your wedding favors, choose from a comprehensive collection of gorgeous designs. 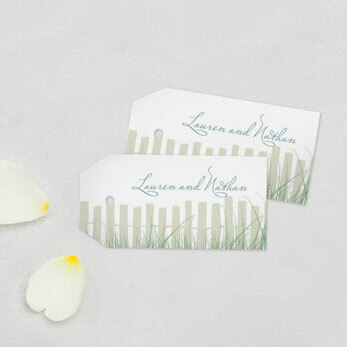 We offer tons of favor tag designs that fit any wedding style or theme—from trendy, modern patterns to watercolors and classic florals. Personalize any design to fit your wedding reception theme! Each Favor Tag design comes in coordinating Table Numbers, Place Cards, and other Reception Items. 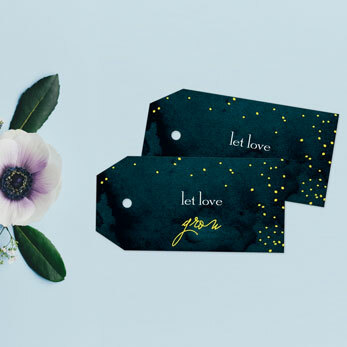 Wedding Favor Tags may seem like a subtle touch, but their charming details will tie with other Reception Items to create a fantastic reception vibe. Don't forget about the details! Guests will so appreciate a Wedding Favor Tag personalized with a thank you note, quote, or photo from the happy couple.